Christmas looms ever closer and it's time at Shades to use those photographs in a project! In a recent trip to Barnes and Noble I found some interesting calendars. They were CD case calendars. The case opened making its own easel stand and could sit on a desk or shelf. Making one of my own didn't look too difficult so I did some research and tinkered. 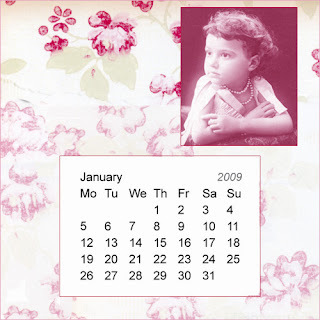 Cases specifically for this purpose (calendar) can be found for sale online. Here is one site where the cases are sold. You can also use an empty jewel case, the same kind you purchase at your office supply or computer store. Pre-made calendar templates abound on the internet. Both the simple and free; and the fancy that cost. Cottage Arts has several CD case templates that you can purchase. The prices range from $3.99 to $5.99 and can be downloaded. 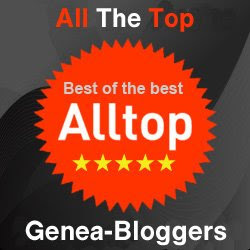 About.Com has several CD case templates for 2009 for free. I created my own template in Photoshop. You have several printing options. Using your home printer you can print two months on an 8 x 10 photo paper specifically manufactured for your printer. You can also take your 12 templates (2 to a page) to Kinkos, Costco or Wall-Mart. For presentation, consider designing a cover for the project. Here is the finished calendar in the CD Calendar Case. 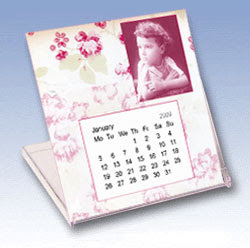 If you use a regular CD case you have the ability to include a CD or DVD of family photographs with the calendar gift. The drawback of using a regular CD case is that it does not close, making it more difficult to mail. The professional CD calendar cases close.